Front of the recipe card for Idaho German Potato Pancakes. 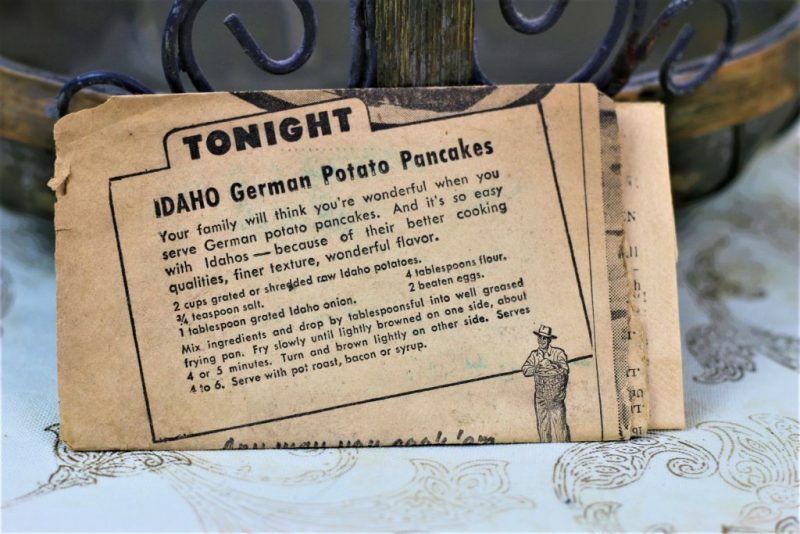 There are lots of fun recipes to read in the box this recipe for Idaho German Potato Pancakes was with. Use the links below to view other recipes similar to this Idaho German Potato Pancakes recipe. 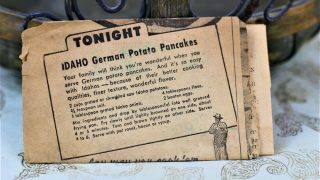 If you make this Idaho German Potato Pancakes recipe, please share your photos and comments below! Mix ingredients and drop by tablespoonsful into well greased frying pan. Fry slowly until lightly browned on one side, about 4 or 5 minutes. Turn and brown lightly on other side. Serve with pot roast, bacon or syrup.